I retired a few years back to help my wife, who’s health is failing. 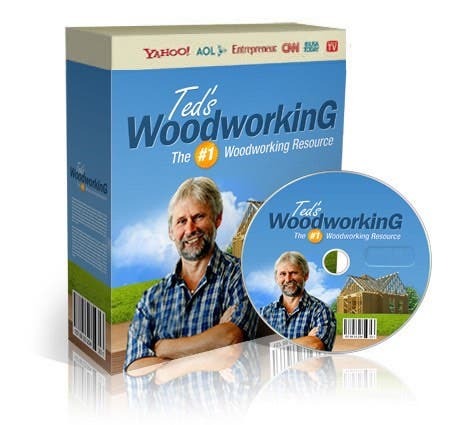 Looking for something to do to occupy my spare time without leaving her by herself, I decided to drag out my woodworking tools and work in the garage on little projects. I went to wally world and purchased a baby monitor to listen for her if she needs help (she’s confined to a hospital bed) while working outside. This is probably the best and most used tool I have ever invested in. It has opened up a world of possibilities to create different projects. I started off small with things for around the house. These little projects got boring after a year or so. At night I like to surf the web and look at interesting things. The Tiny House movement caught my eye. After researching a few months I decided to build one, and did. But that’s a different story. It’s not what this story is about story. If Kent is interested in that build I’d love to share it with you. 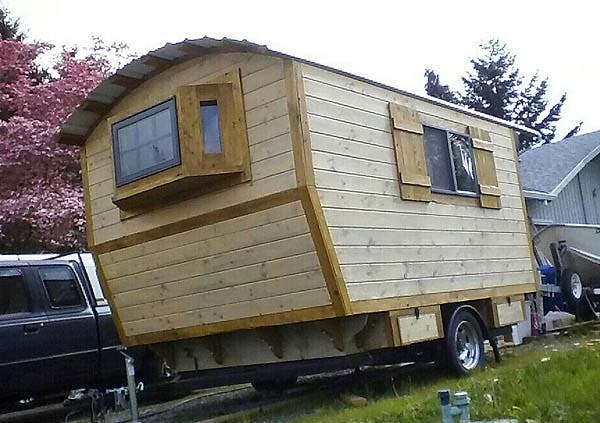 This story is about a rustic looking little cabin on wheels. It’s mounted to a 6 x 10 single axle trailer. I wanted an 8 x 12 so I made corbels for the sides and front which got to 8 x 11. On the nose I came off the corbeled ledge on a 17 degree angle for 3 feet. That got me the extra foot I wanted. I didn’t want to sacrifice any more floor space to make room for the full size bed. It is not equipped with a bathroom, from my past experiences camping I always used their facilities so why waste the space. There is a storage area under the bed that could house a port-a-potty. Hal, what a great little Vardo. 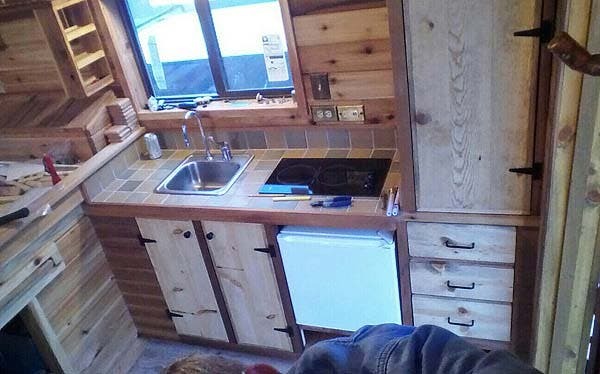 I just finished looking at your build pictures, I highly recommend them to anyone thinking of building a tiny house or trailer. Very impressive how quickly you built your wagon and how well it came out. Nicely done. That is such a great Vardo. A beautiful floor too. 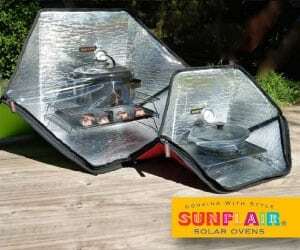 Be it guest room or camping, either one would be doing it in style and comfort in this. What an amazing job you did! Wonderful! I want one! You did a great job. Hal, what a beautiful tiny house and journal. I especially loved the front door! I have never seen a floor like you have made–very different and very creative. You must have been a carpenter by trade since you did such an exquisite job. I will pray for your wife today. I hope she can get a glimpse of what you are working on. Maybe a video cam? I love your Vardo and I really love the flooring!! Thanks for posting the pictures and the link to the full build. Very handy and well done. Enjoy your project. Like your wife, I have some mobility issues, and my hubby is always puttering with new projects. I’ll have to remember the baby monitor trick…that will come in very useful in our future!! Beautifully crafted. A work of love. The floor is interesting- looks like end cuts of wood sanded to show the grain? I do hope your wife will be able to recover some day and enjoy your creation. Just a thought, have you considered ever making a little book or illustration book you can share with others who may be experiencing the same caretaker issues you have with your wife. Creativity can be a life saver. 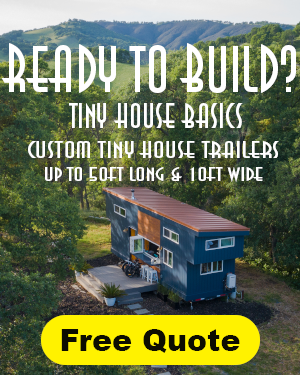 I agree-I’m a caregiver to my 84yr old mother, and am also building a tiny house, which will be my home when she passes…your build is my favorite! It is good to hear your comments about your wife and the care you take of her. I like your wagon and the choice of colors. Hope you can use it with her someday. Love it. Tried to follow the sky drive link but says it is expired. Are you keeping this or is it for sale. My son is wanting something like this and he lives in Oregon. Most I have found are around us here in the South. Just thought I would ask just in case it was for sale. Yes it is for sale. I live in Salem if your son wants to look at it he can contact me via email. chmwash@gmail.com. thank you for your interest. Oh, it’s lovely- very nice work, you must be really proud! It looks great, I hope you have some awesome trips away and enjoy your beautiful craft work! oh wonderful….you have done a beautiful job …. I like the design. My only issue with it is the front of the Vardo, i.e, the tin roof. Aren’t you worried about driving down the road and wind catching the tin and peeling it back? Just was thinking that you might want to add an aerodynamic feature to the front to create less drag. It would also help with gas mileage. Beautiful vardo, Hal! Great workmanship. I also love the floor and the Dutch door. South Dakota prayers also ascending for you and your bride. Very nice….Did you build it to be as light as possible as well ?? Your a talented man! Thanks for the share. My dads name was Hal. Good Name!!! Wonderful! What a lovely vardo you made! Thank you so much for sharing it. It is an inspiration! 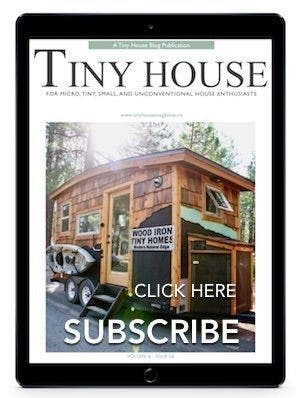 Awesome tiny house!! Great design. I really love the floor. How is the floor holding up? Can you tell me how you did the floor? I would like to try it in my family/kitchen area of my home. Thanks for posting the wonderful pictures. Kathleen, thanks for the compliments. The floor is holding up well. It has 5 coats of polyurethane on it and it’s hard as nails. It’s made from cedar 4×4 s that were end cut 3/4 inch thick. I used the sawdust from the cuts to make the grout mixture mixed with the urethane. 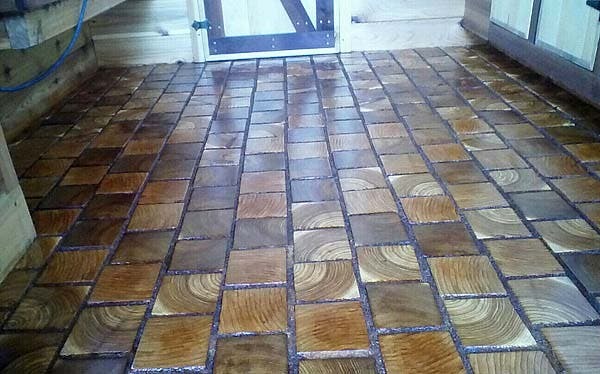 You can Google cobble wood floors and find the diy tutorial I used to get me through it. I’m happy with the way it turned out, but it was a lot of sanding, I mean alot! I am inspired! Great gob! That is what I want to build! Nice Vardo! I would love to know what the dry weight is. The weight is one spec that is usually not mentioned in all the wonderful little homes you see on this site, and it is a critical on if a person plans to tow the little house around much. Also, what is your ceiling height? Kudos to you for using your time so creatively. Best wishes to you and your wife. Hal, I love it. 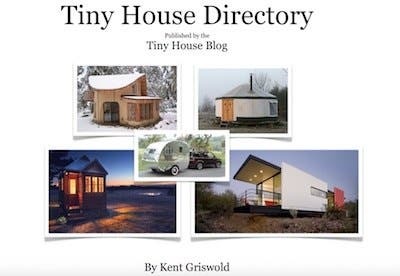 Ken, let’s get pics of this tiny house as well. Very nice house. I’m curious about how you finished the lovely floor. Well done! You can see how Hal did that floor about half-way through this smilebox. Great look, Hal! 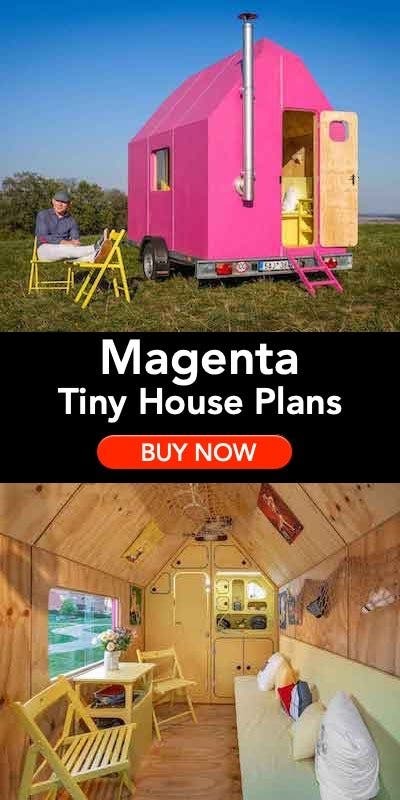 I bought plans for a Vardo, but like some the ideas you have. Might have to incorporate at few :). Love it! Do you have any specs on this? i.e. total cost? trailer weight? gross weight? I haven’t had it weighed yet. I plan to as soon as it is completed ( hopefully this week ) one of the chimney pipe parts came in damaged. So another one is due in tomorrow. This project should be completed by the weekend. Then it will be weighed. I’m guessing around 3000 pounds, but we will see. I pulled it ok on a test run with my b3000 3.0 liter v6 so it can’t be too heavy, I think. As for total cost $6758. Keep in mind some of material came from the local restore. The interior and exterior wood was ordered from the land of the mighty Ducks in Eugene Oregon. Thanks to all for the compliments. Are you planning on selling any plans or are you going to build anymore. Nice work ! Please advise! Hi Frank, I do not have any plans, I envisioned what I wanted to build, drew it out on paper and started building it. I dislike working with plans, it doesn’t seem as rewarding to me. I do plan to build again. As noted it the story, I built this in my drive way. So I needed to sell this one to make room for the next build. I’m hoping to this one will find its new home soon as I am anxious to start my next project. Thanks for the compliments. I am a vardo fan from way back. I even belong to Vardoshavora on Yahoo Groups! 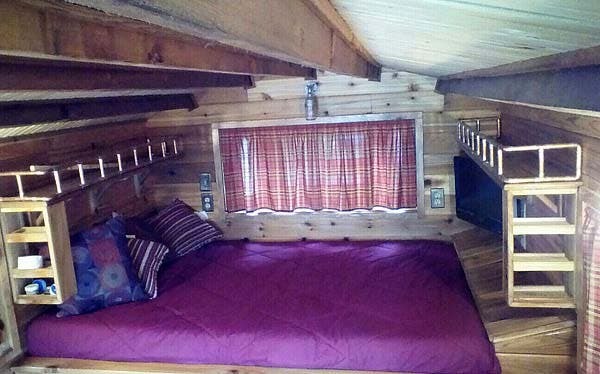 This vardo is totally awesome and thank you for taking the time to share it and the building process with us. The flooring is remarkable and the overall is warm and inviting; great job! Please join Vardoshavora and post all of this in the photo gallery for everyone there to enjoy. The word “Vardoshavora” means people who love vardos. Thanks again and enjoy! That is just awesome, and is more or less exactly what I am looking to build. Now if only I can get my partner to go along with me on it.. But it is great keep up the good work…! I am sorry I didn’t catch this earlier when I wrote my comment before. I only just found your photo journal of the building of the ladybug., and I want to say thank you so much, because you have given me more motivation then I have had for my project then ever before…! You are a wonderful person, you have gone through so much and yet you built one of the best examples of a real vardo then all the showman wagons that I have seen that were listed as vardos.. My hat goes off to you…! P.S. I will do a photo journal as well to share with everyone as you did, only hope I can measure up to your superior workmanship…! Hi Zach, and thanks for the kind words. Sorry I haven’t replied stoner to your comments. I’ve been busy these post free months working on another project called the caboose. I built this one with no plans, just thoughts I’ve had for awhile. Anyways hhere is a link to the build album if you want to peek. It’s not completely done but will be in the next week or so. Thank you for the invite on your project. With my wife’s health being what it is, I’m preoccupied with caring of her. I would have jumped at the opportunity to go to the Caribbean for a build as well. Enough said. I wish you well with your projects at hand. And believe me, there are a lot of skilled craftsmen out there that will apply for that build. Great Cabin! Any idea of the weight? What is it like to tow? Have you considered building one for a client? if so, what would your price-range be? 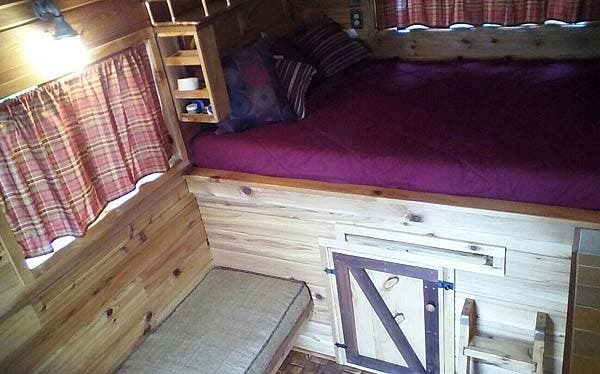 I’ve been looking to commission a mobile Tiny House for a while now, and this is absolutely perfect!!! of course, since it would be a permanent live-in home there would have to be a stove and a bathroom, but other than that, it’s absolutely perfect. perhaps you could turn the bed into a loft bedroom area? that would free up some space for a compost toilet. 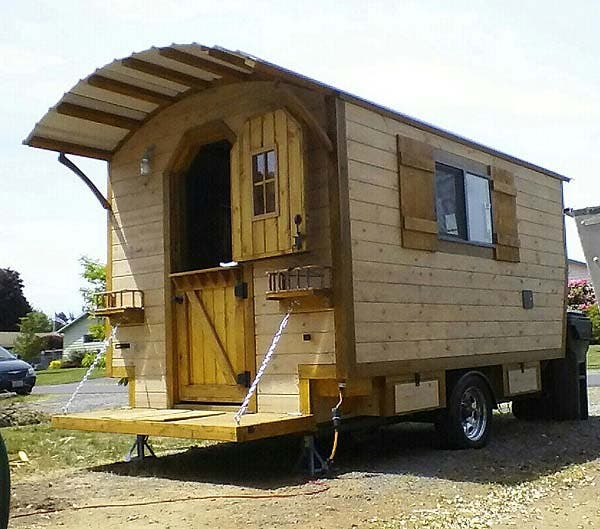 currently I live in TN, but if you were interested in building one for me, I’d gladly drive to come pick up the vardo of my dreams!